This post was not sponsored by Whole Foods, by the manufacturer any of the items pictured, or by anyone else. It is 100% un-funded, un-sponsored, purely private opinion. If you think of organic groceries, Whole Foods is probably the first store that comes to mind – it’s the retail giant of the natural foods movement. 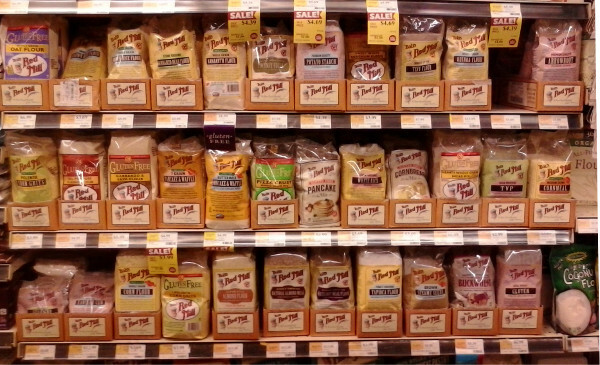 Whole Foods does carry a lot of Paleo staples, like grass-fed meat, wild-caught seafood, and a whole line of grain-free flours. But it also has some products that look Paleo but aren’t. Read on for a picture-heavy virtual “walkthrough” of a Whole Foods – what to snap up, and what to leave on the shelf. 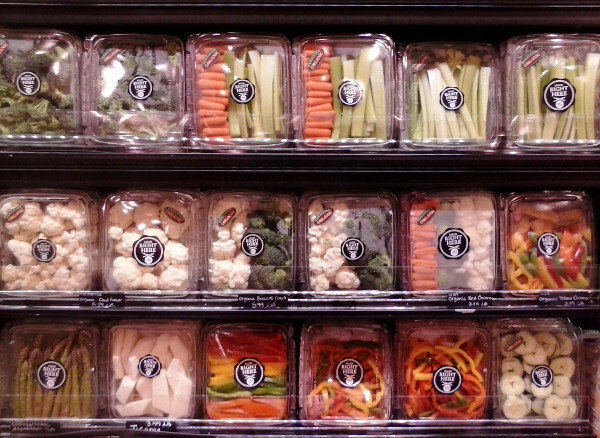 Note: here, we’re focusing on specialty foods that make Whole Foods different from other stores. On a Paleo grocery trip, the vast majority of your cart should be full of fresh fruits and vegetables, and fresh unprocessed meat. But if you want an apple or some chicken, you can go to any grocery store in the world. The point of doing a writeup for Whole Foods specifically is to see what makes Whole Foods unique or particularly interesting – which is mostly treats and “extras.” So with that caveat, let’s get started! Snack alert! 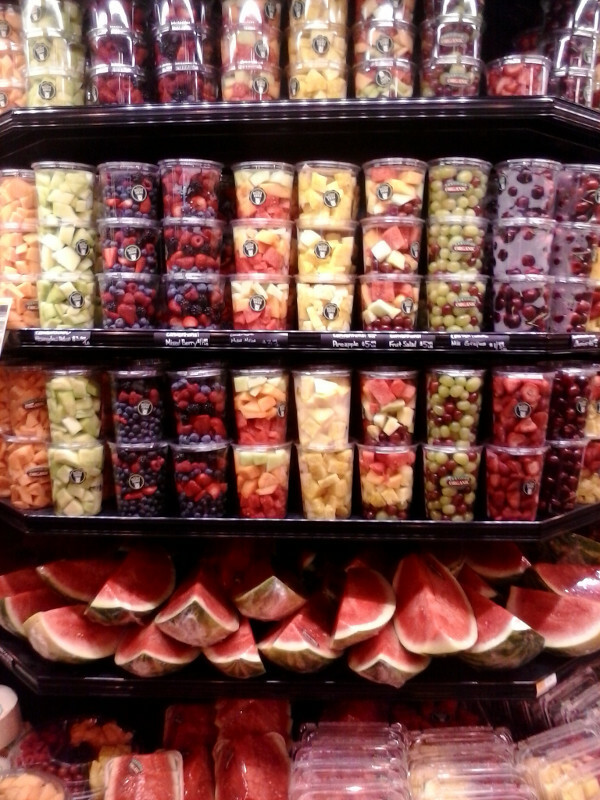 Right when you walk in, you see a display of pre-cut fruit. You’ll pay for the convenience, but these make handy snacks to grab in a hurry, especially for busy parents who need something kid-friendly. The Whole Foods house brand guacamole and salsa pico de gallo are also Paleo-friendly and very convenient! Just beware the other salsas; a lot of them have corn in them! 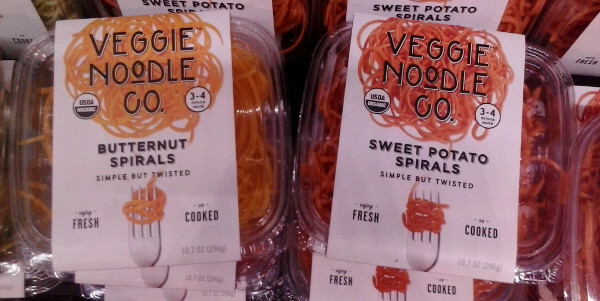 The ingredients list on each package had just one ingredient: whatever the noodles were made of (zucchini, butternut squash, or sweet potato, depending on which type you got). 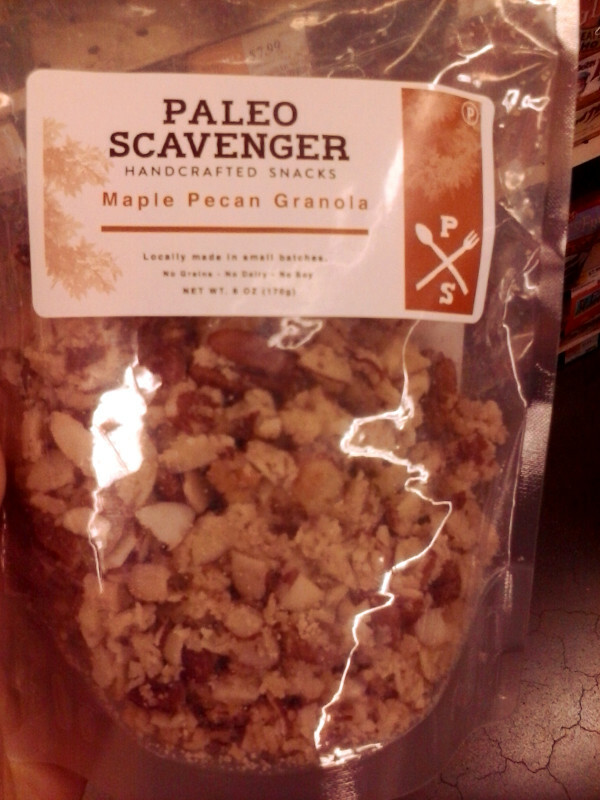 Paleo approved! 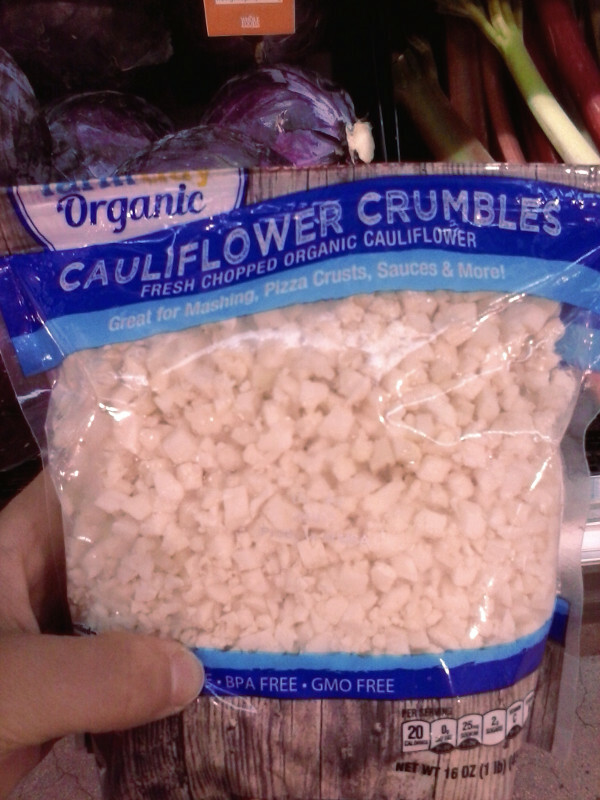 No time to grate your own cauliflower? No problem! Pre-crumbled cauliflower is perfect for making recipes like this soup. Unfortunately, now it’s time for something a little more negative. These supposedly “healthy” juices…aren’t. 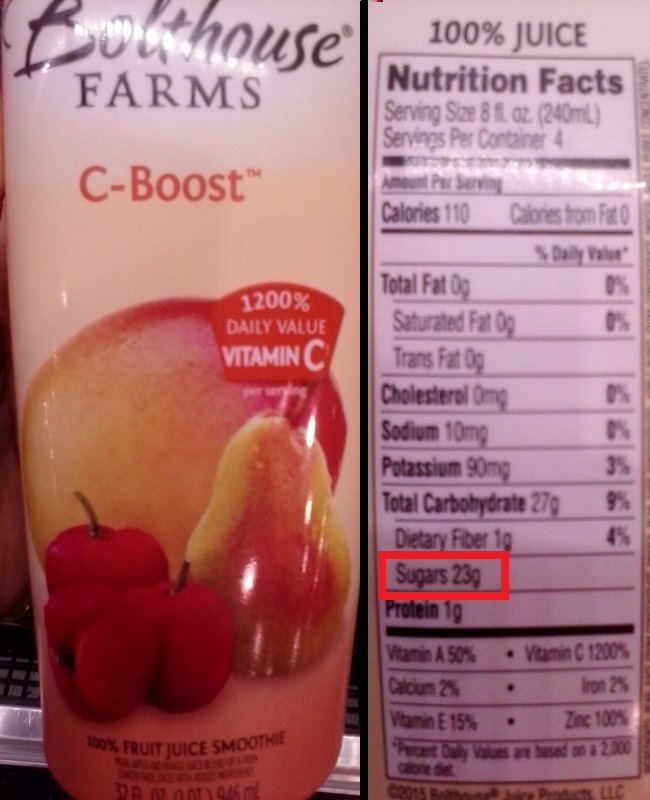 Don’t be fooled by all the “100% juice” and “Vitamin C” on the front – take a look at that sugar content on the back. Ouch! The lesson: not everything in the produce section is healthy. 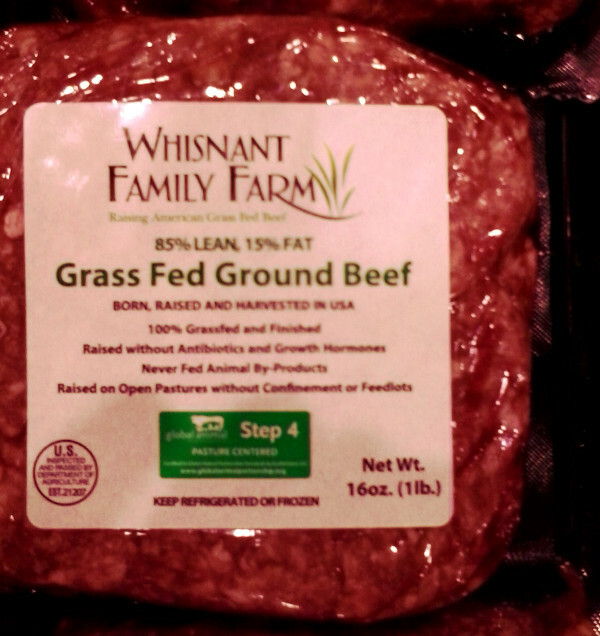 Moving on to the meat – and again, here we’re focusing on things that are specific to Whole Foods. This stuff shouldn’t take up the majority of space in the shopping cart. When living outdoors, chickens and turkeys get to forage, pigs get to wallow and cattle get to roam. Ideally, look for Step 4 or above to get meat that’s really good by Paleo standards. 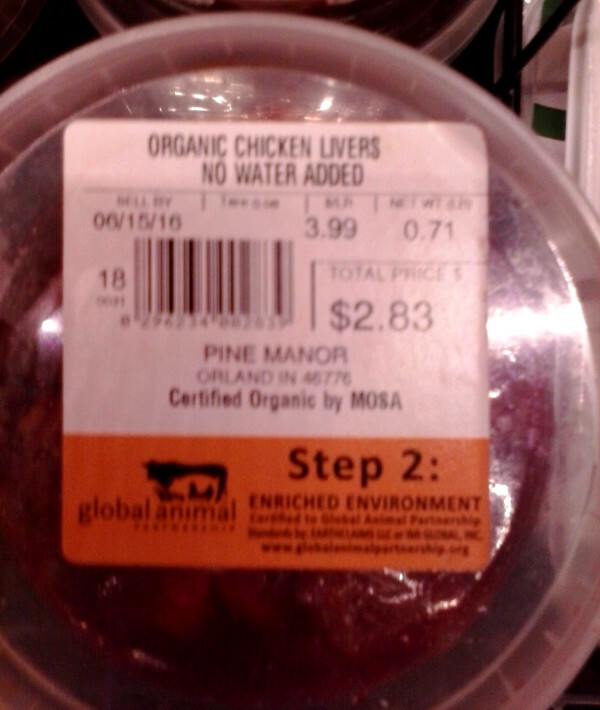 These chicken livers are Step 2, which is still better than nothing! 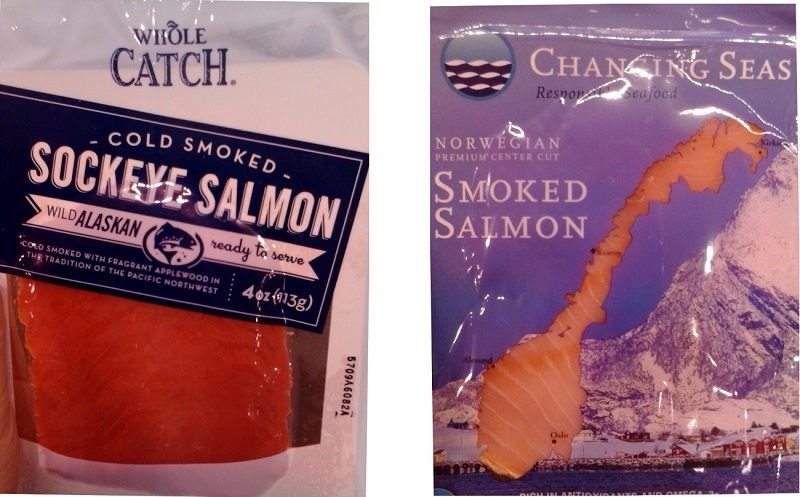 Whole Foods also has some specialty meats that are pretty tasty, including smoked salmon. But beware what you bring home! Do you know which one of these two packages you should choose, and which one you should avoid? 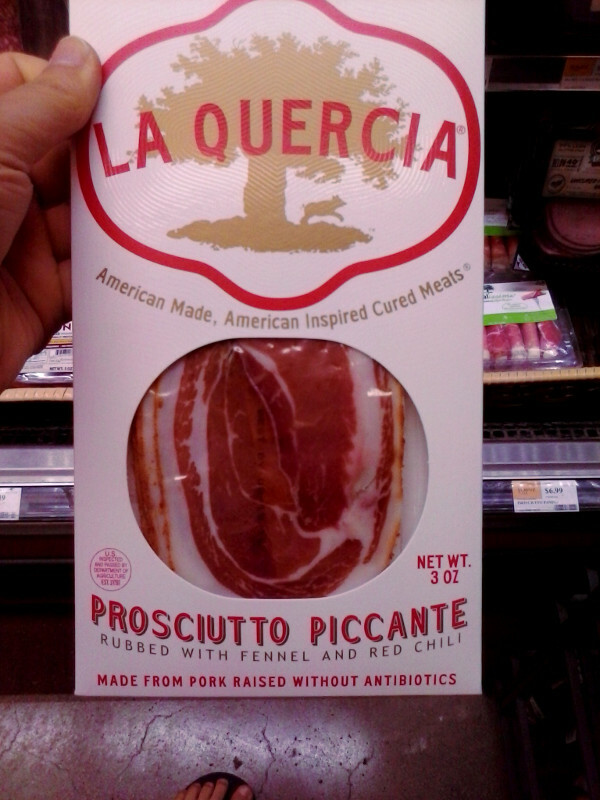 Prosciutto made with totally Paleo ingredients: pork, salt, and spices. Dessert, anyone? 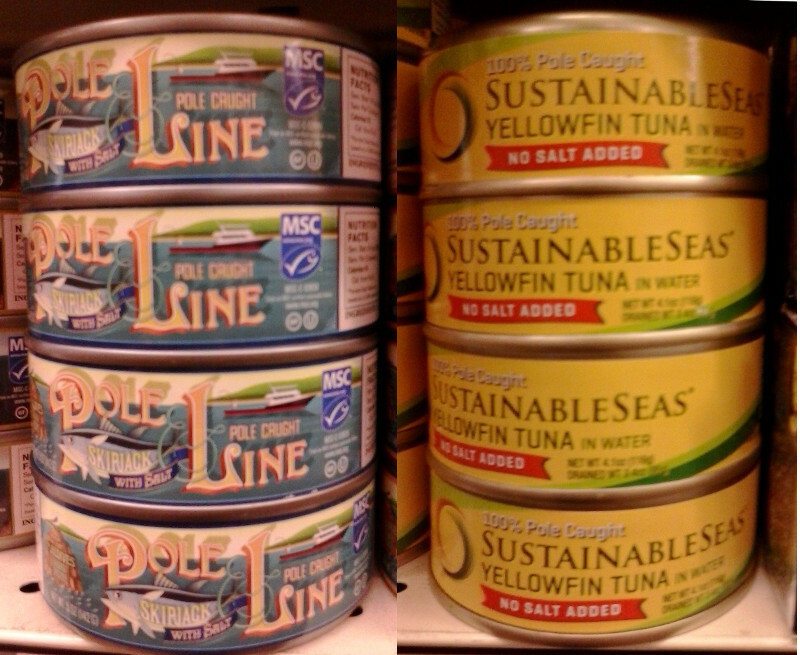 See that little blue sticker on the cans to the left, with the white “MSC” and the fish on it? That’s the Marine Stewardship Council sticker, and any fish with that sticker is sustainably caught. You can see that the colors change, so watch out for the different -colored versions! 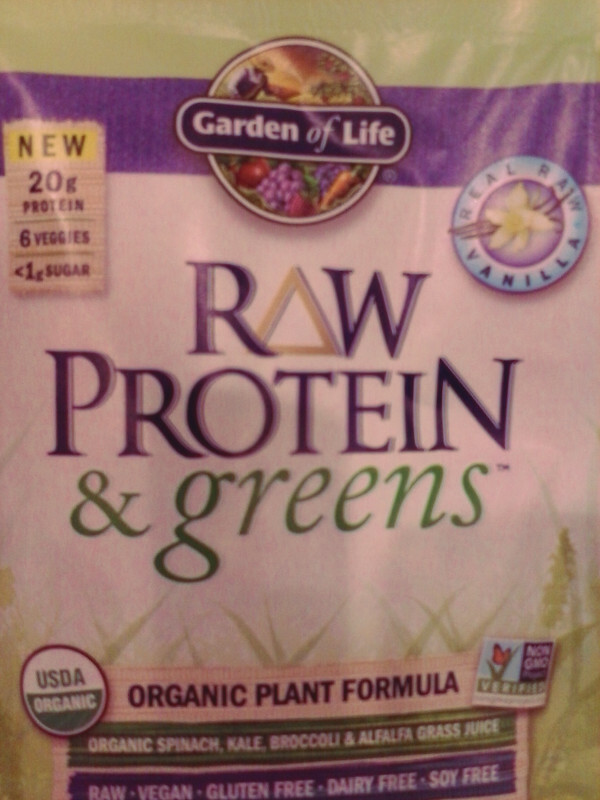 Ingredients: Organic RAW Protein & Greens Blend: Organic sprouted brown rice protein, organic pea protein, organic spinach (leaf), organic chia protein, organic alfalfa grass juice, organic broccoli (stalk and flower), organic navy bean (sprout), organic carrot (root), organic beet (root), organic kale (leaf), Organic Flavor Blend: organic vanilla flavors, organic stevia extract (leaf), RAW Probiotic & Enzyme Blend: lipase, protease, aspergillopepsin, beta-glucanase, cellulase, bromelain, phytase, lactase, papain, peptidase, pectinase, xylanase, hemicellulose, [lactobacillus plantarum, lactobacillus bulgaricus] (1.5 Billion CFU). 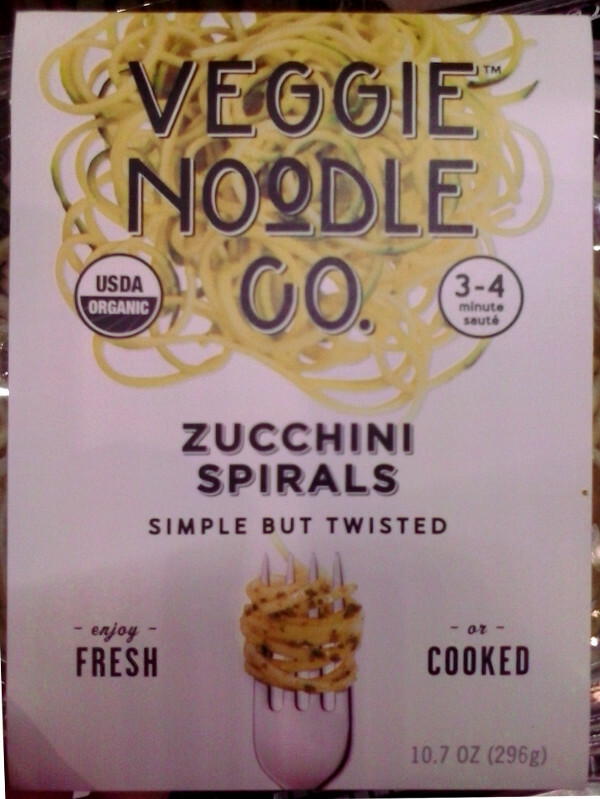 It looks so great until you read the ingredients list. Spinach! Kale! Broccoli! Raw, gluten-free, dairy-free, soy-free, protein AND vegetables? But brown rice, peas, and navy beans aren’t Paleo. This is why it’s important to read the back of the package. You could do a lot worse, as protein powders go. 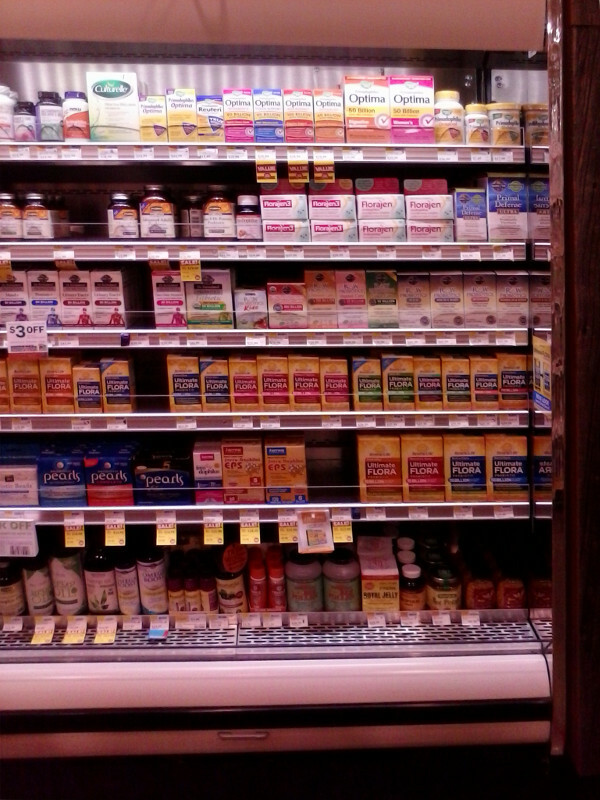 Opaque bottles, and refrigerated. 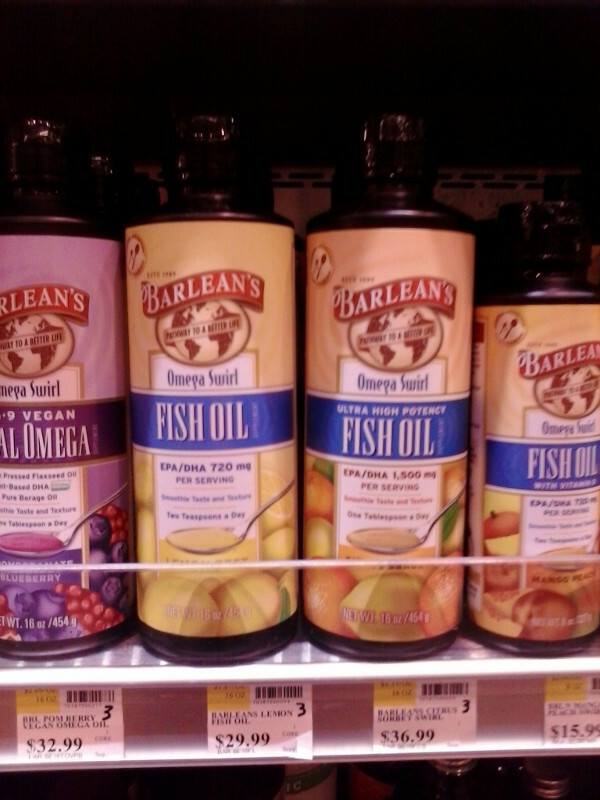 This is how fish oil ought to be stored! 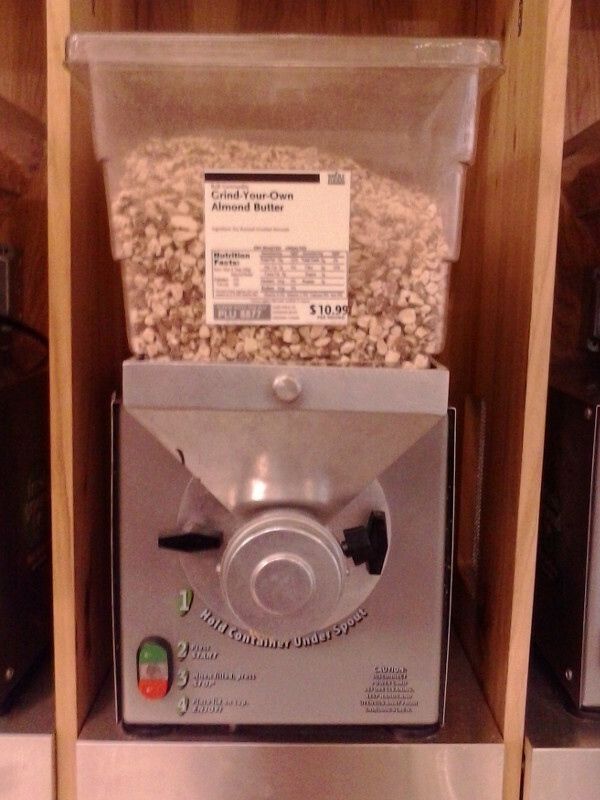 Now for a look at the bulk foods. 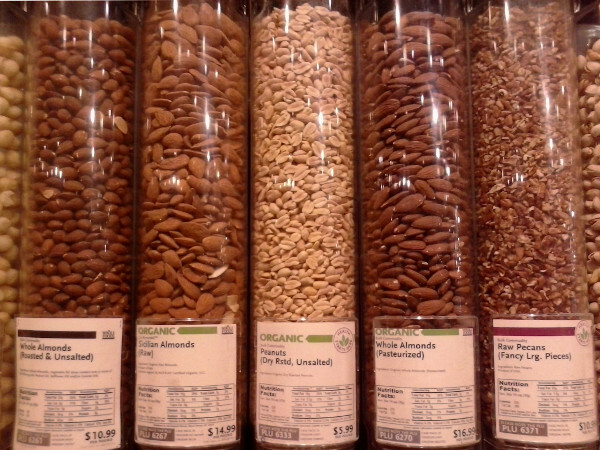 The bulk foods aisle at Whole Foods is a great place to save on nuts and dried fruit, not to mention spices. But take a look at the picture below. Can you pick out which one of these things is not like the others? It’s the peanuts! They’re right in the middle of all the other nuts, but peanuts aren’t nuts and they aren’t Paleo. So skip that bin, but load up on almonds, pecans, and other nuts. 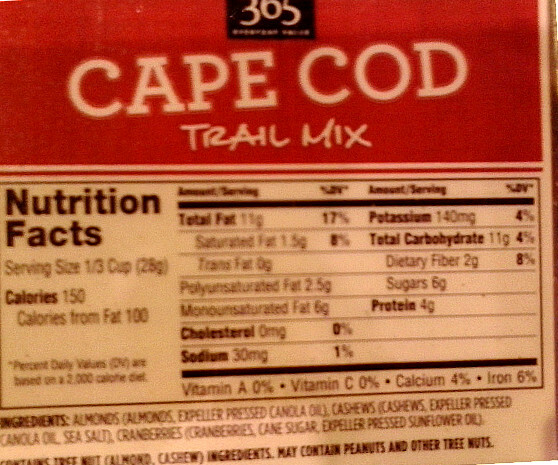 In case you can’t read that teeny tiny writing, look at the ingredients: “Almonds (almonds, expeller pressed canola oil), cashews (cashews, expeller pressed canola oil, sea salt), cranberries (cranberries, cane sugar, expeller pressed sunflower oil).” If you just looked at the bin, this trail mix would look fine, but make sure to read the ingredients to catch any hidden junk. …cheap spices! 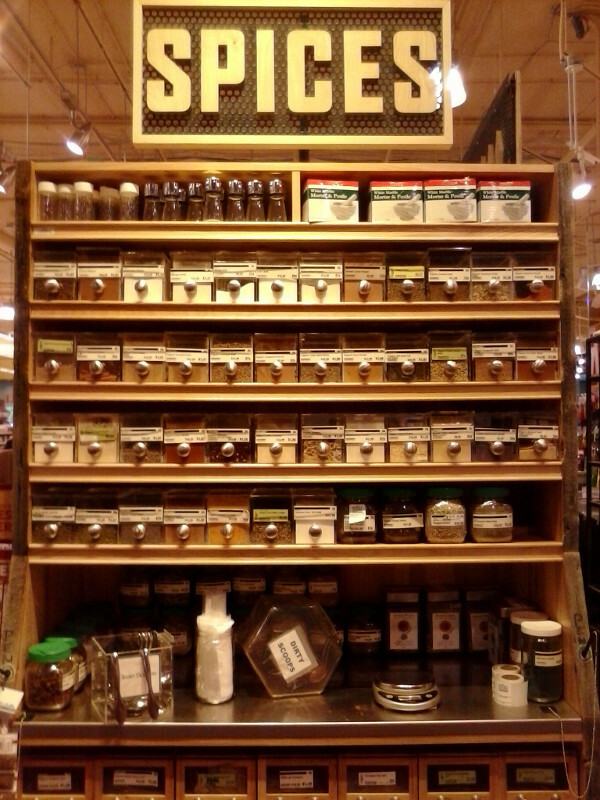 Bulk spices are much more affordable than the pre-jarred kind. 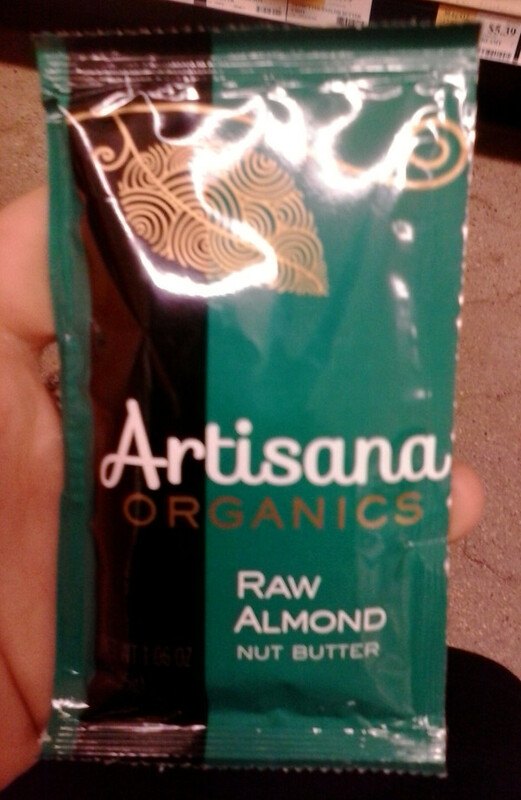 Which comes in handy if you like your almond butter really fresh! Here be dragons, but here also be some unexpected treasure, so don’t shy away too soon! 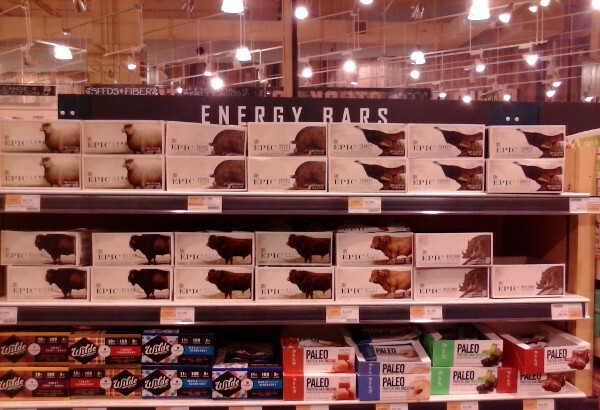 Let’s start with the enormous display of energy bars. An energy bar doesn’t count as a “meal” for Paleo purposes – there aren’t any vegetables, and there’s typically not enough fat. But they can be lifesavers in emergencies, especially if the choice is a Paleo-friendly bar or McDonald’s. 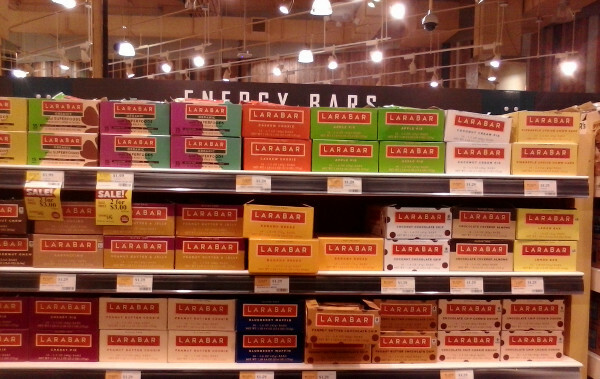 Epic bars (on the top two shelves) and Paleo bars (bottom right) are two decent options. So are some flavors of larabars, but watch out for peanuts! Paleo Leap members can see a full nutritional comparison of dozens of different Paleo-friendly bars here. You can see that they’re all dark chocolate, which minimizes sugar. 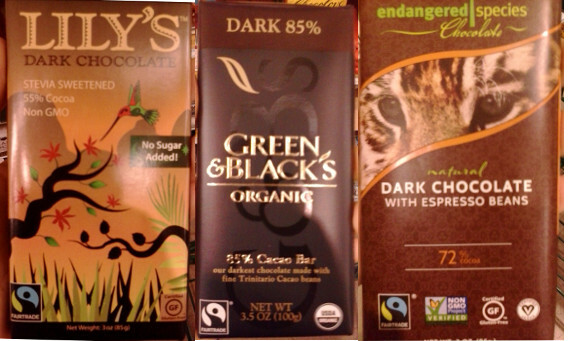 And if you look in the bottom left-hand corner of each bar, you’ll see the Fair Trade logo – that’s important! A lot of cheap chocolate is made by child slaves, which is horrible and not something you want to support. A Fair Trade logo shows that at least the company is trying to avoid that. 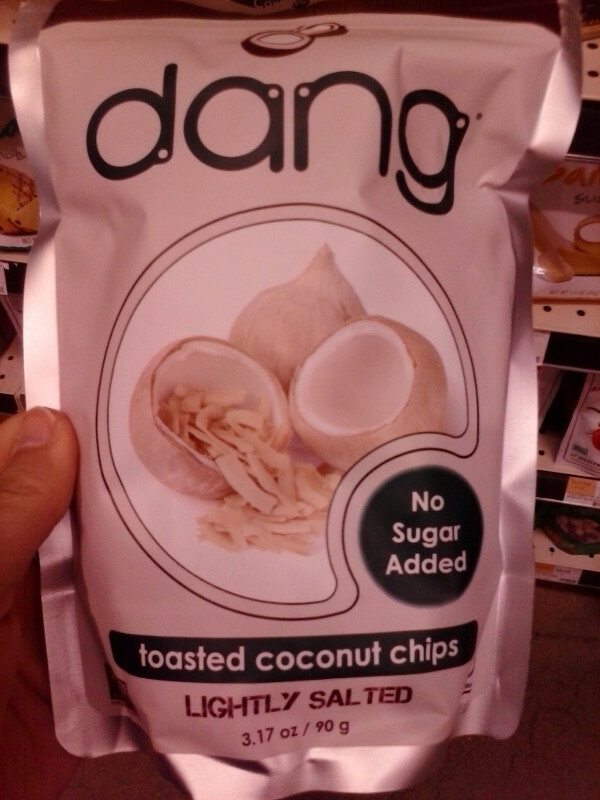 The ingredients are “coconuts, sea salt” – not bad! 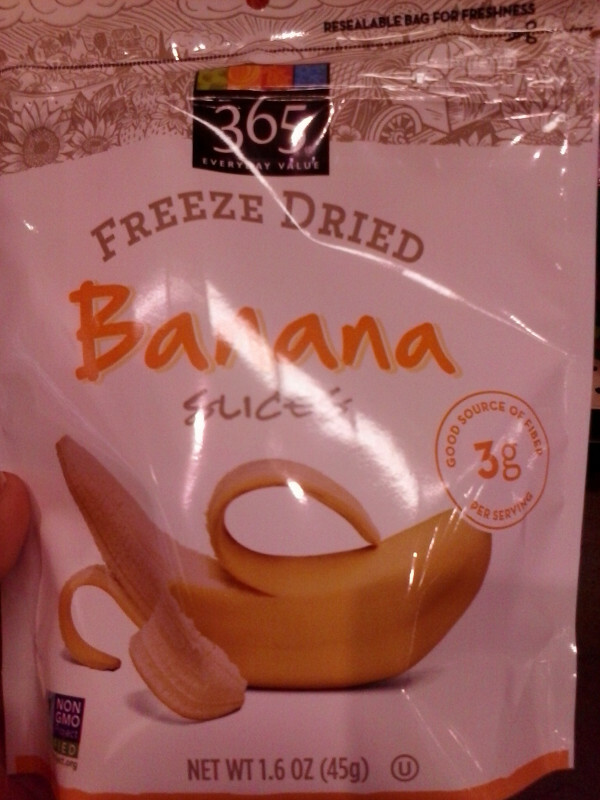 Which looks very virtuous and all because the only ingredient is bananas. But if you look at the back of the package, you’ll see huge sugar counts – 24 grams of sugar in one serving, in this case! Dried fruit has a lot of sugar. Right next to this stuff is an aisle full of chips. 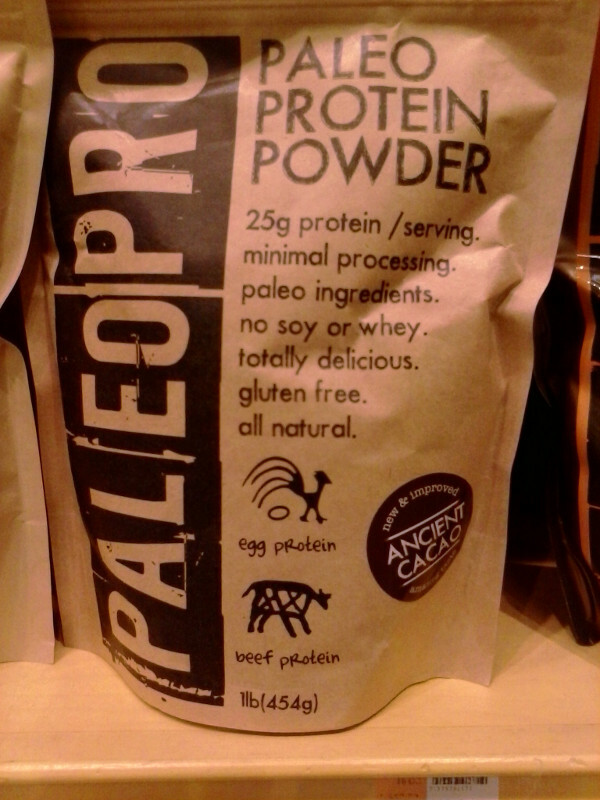 Some of them look like they might be Paleo-friendly, but look at the back of the package! 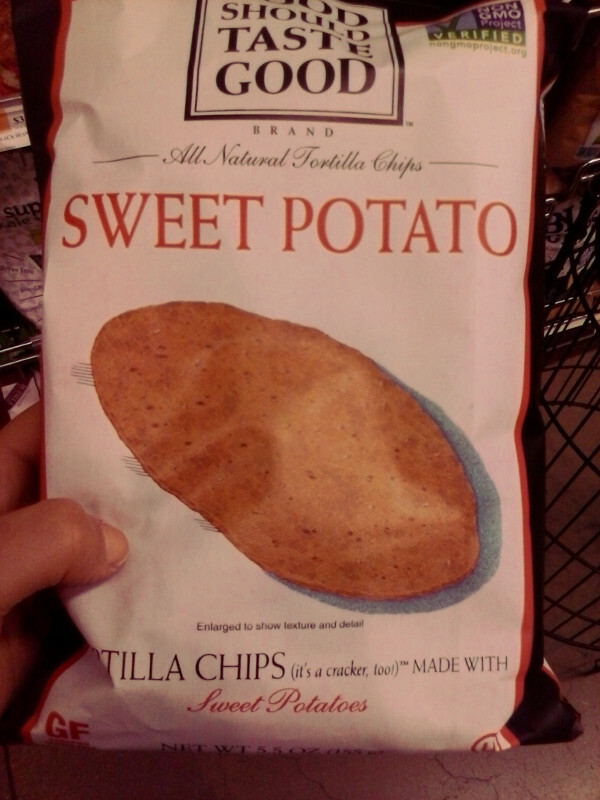 Sweet potatoes? 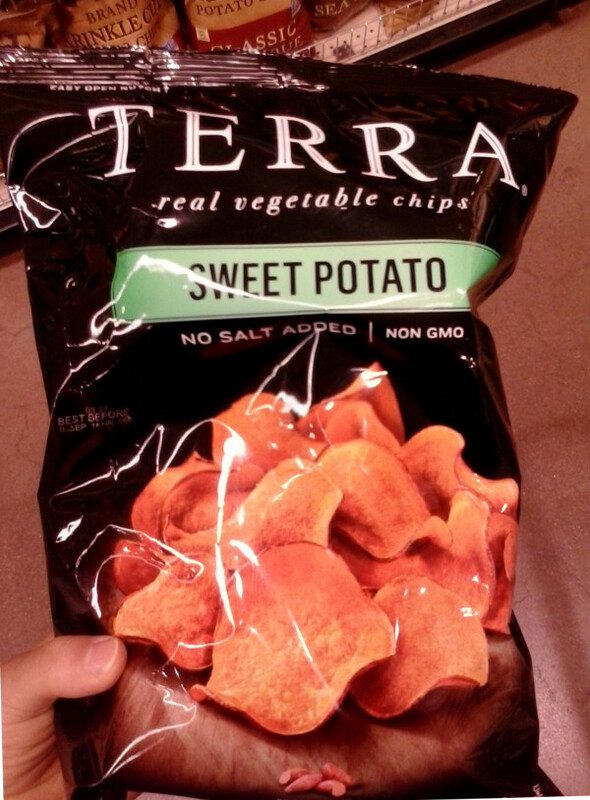 Sweet potatoes are Paleo right? 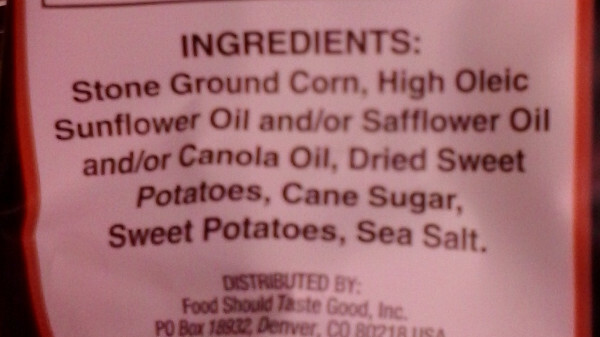 Sure, sweet potatoes are Paleo, but corn, sunflower oil, safflower oil, canola oil, and cane sugar aren’t. Pass! But flip it over and you’ll see that they’re cooked in “expeller pressed canola oil and/or safflower oil and/or sunflower oil” – that’s batting three for three on gross industrial seed oils. Pass! 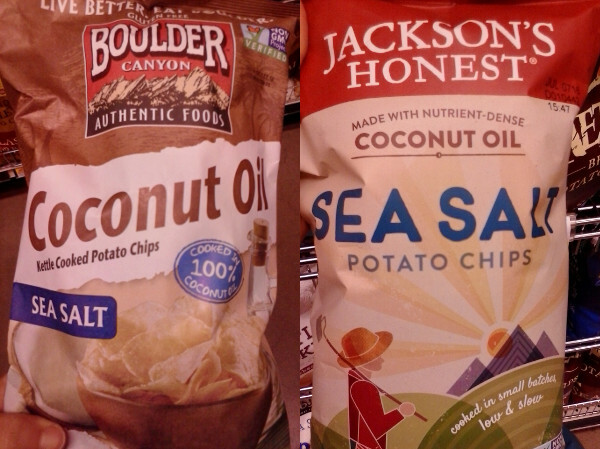 On the other hand, if you eat white potatoes, you actually have some options cooked in coconut oil. Even the mention of white potatoes always stirs up controversy – nobody is saying you have to eat them if you don’t tolerate them. People with an autoimmune disorder might need to avoid them, and some people might simply prefer to skip them. But they’re not any less nutritious than sweet potatoes, so if you do well with them, there’s no nutritional reason to shun them. You can read a full comparison and defense of white potatoes here. The healthiest food in the world? No. Better than Lays? Definitely. This is a very nut-heavy “granola,” and nuts aren’t a staple food, so this shouldn’t be your breakfast every morning. But as a treat, it’s not bad – and it looks pretty tasty! This is grain-free flour central. The labels are too small to read, but there are two different types of almond flour in here, plus tapioca starch and coconut flour. If you’re looking for any Paleo baking ingredients, you’ll probably make a stop here. 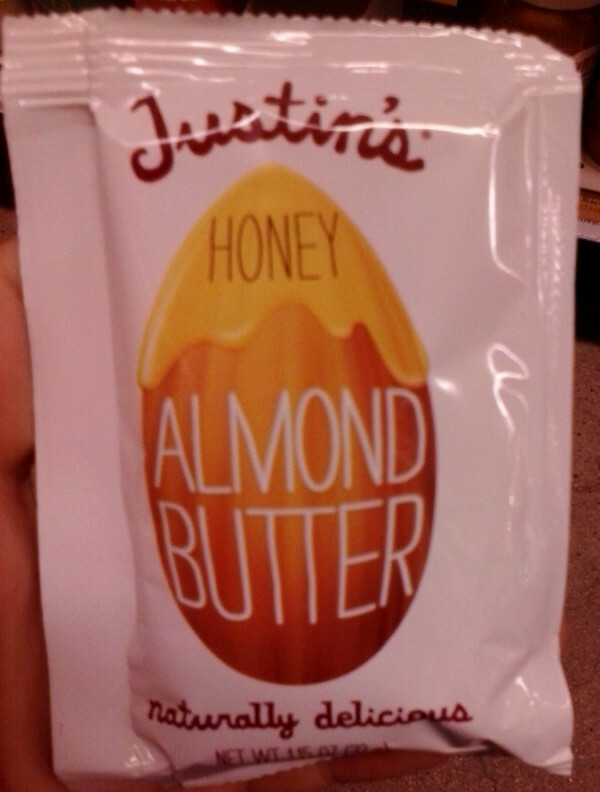 They have a couple different flavors, but just to take one example, the honey flavor has added sugar. 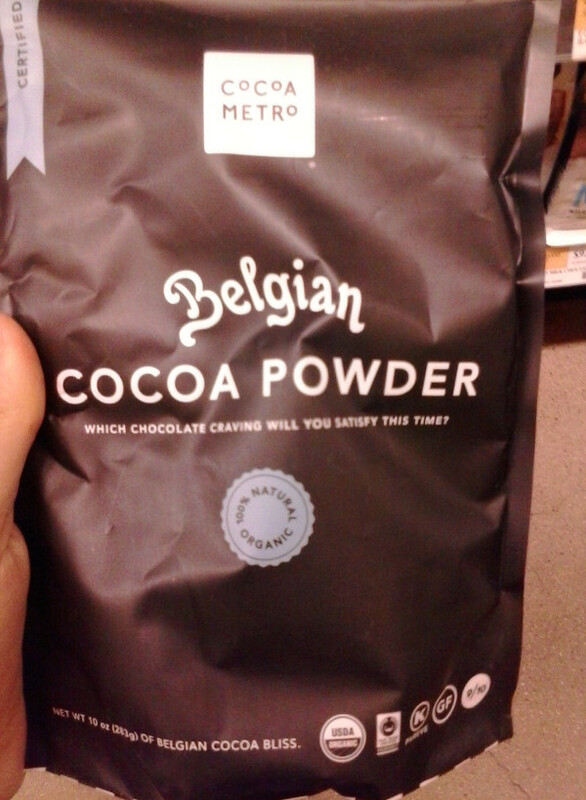 Also in the baking aisle is cocoa powder. Cocoa powder is full of antioxidants and great for adding some chocolate flavor to your food with total control over the amount of sugar you use. And if you squint on this one, you can see the important fair-trade logo just to the right of the organic logo on the bottom. Canned coconut milk is the kind to get – it has fewer preservatives than the shelf-stable boxed kind. Skip the boxes and get it in cans. 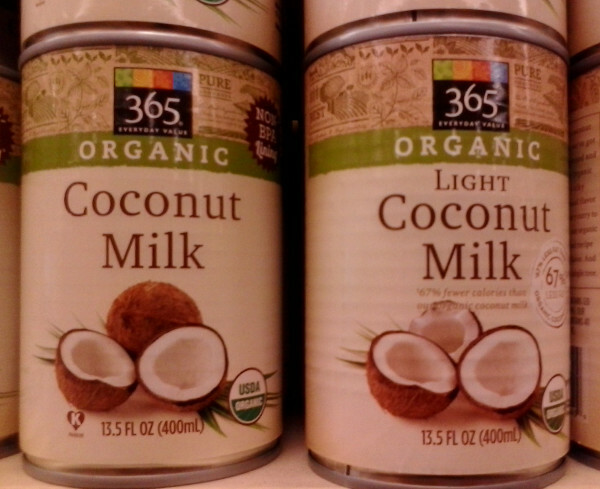 On the left you can see full-fat coconut milk, which is the type to go for. The light coconut milk on the right is basically diluted full-fat milk for the same price, so you’re just getting less food for your money. If you want it diluted, buy the full-fat milk and put some water in it for free at home. 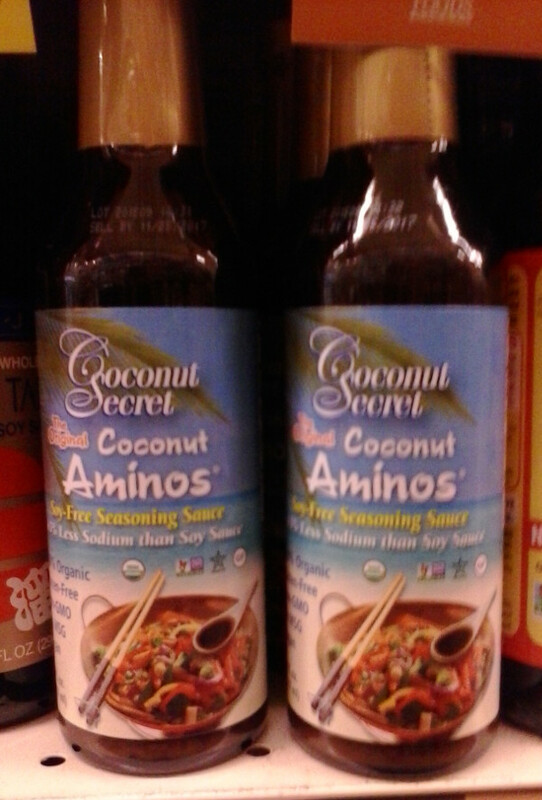 Paleo-friendly “soy sauce,” aka coconut aminos. 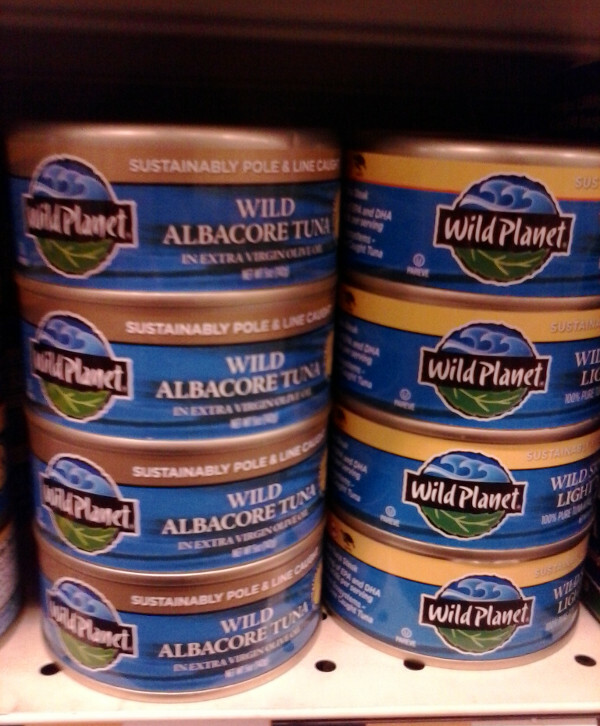 These are really delicious in broths; just throw them right in the pot to simmer and fish them out when you’re done. Seaweed is full of important minerals and other nutrients. 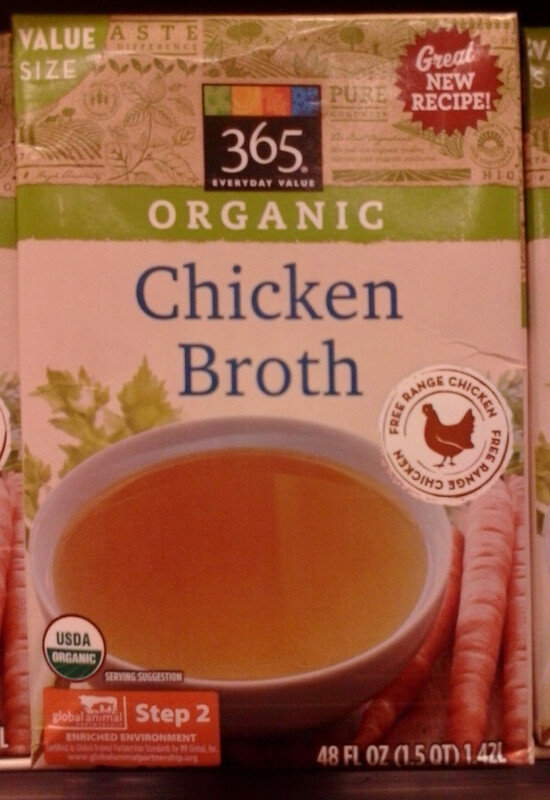 These broths have a minimal amount of preservatives and overall they’re pretty good choices. …And that about wraps it up! Is there a specific category of food that you would have liked to see? Is there another store that you want a walkthrough for? Let us know on Facebook or Twitter!